There is a lot of talk about and use of launch monitors in golf instruction today, and they truly are an invaluable tool. However, many of the numbers are predicated on center face contact. So if you are unable to hit the ball with the center of your clubface, then some of the numbers really do become a bit irrelevant for you. Our first drill this month will help with that. Our center contact drill (pic #1) actually helps with two things. First, the tees to either side of the ball will help you see if you are putting the ball in the center of the face, and the lie board behind the ball will help you make sure the bottom of your swing is in the correct place. If you do not have access to a lie board, you can use anything to put behind the ball, even something as simple as a magazine. Line up so that the tees are only slightly further apart than the length of your club face. Make sure the ball is in the center of the two tees. Then set the lie board about 6-8 inches behind the ball. At this distance you really shouldn’t hit the board but it is a good reminder. Start with smaller, slower swings and build up to your full swing. Once you are leaving the tees and the board untouched you should be seeing a straighter, stronger ball flight. The second drill also has to do with numbers you might receive from a launch monitor. Many players will have a path that is too much outside in. This, coupled with an open clubface, is a classic slicer’s move. But it is sometimes extremely hard for a lifelong slicer to feel the sensation of the correct club path. And remember, our definition of a good drill is one that does all of the work for you and gives immediate feedback! Put an alignment rod on the ground to define your target line. 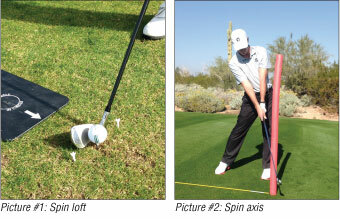 Put another alignment rod in the ground, about 2 feet in front of the target line stick and in front of your lead hip. We cover the stick with a swim noodle for safety. Now make slow motion backswings and then move your downswing towards the swim noodle. When your club makes contact with the noodle your weight should be fully on your left side, your hips just slightly open, the shaft of the club in the middle of your chest and your chest pointing right at the noodle. Your clubface also should have rotated so the toe of the club is pointed up or just slightly left (pic #2). When you get into this position you will feel what it is like to have a swing path that moves from inside out with a clubface that is closed to your path. This is the way to hit a draw. If you find a drill that helps with your particular swing issue and do that drill correctly and diligently, it will be a huge help in improving your golf game.